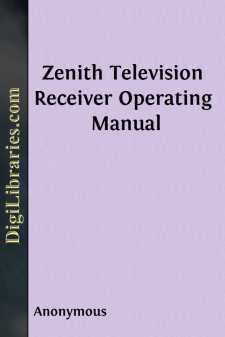 Zenith Radio Corporation warrants the parts, transistors, and tubes (including television picture tubes) in any Zenith black and white television receiver or Zenith black and white television combination receiver to be free from defects in material arising from normal usage. Its obligation under this warranty is limited to replacing, or at its option repairing any such parts or transistors or tubes of the receiver which, after regular installation and under normal usage and service, shall be returned within ninety (90) days (one year in case of television picture tubes only) from the date of original consumer purchase of the receiver to the authorized dealer from whom the purchase was made and which shall be found to have been thus defective in accordance with the policies established by Zenith Radio Corporation. The obligation of Zenith Radio Corporation does not include either the making or the furnishing of any labor in connection with the installation of such repaired or replacement parts, transistors or tubes nor does it include responsibility for any transportation expense. Zenith Radio Corporation assumes no liability for failure to perform or delay in performing its obligations with respect to the above warranty if such failure or delay results, directly or indirectly, from any cause beyond its control including but not limited to acts of God, acts of government, floods, fires, shortage of materials, and labor and/or transportation difficulties. This warranty is expressly in lieu of all other agreements and warranties, expressed or implied, and Zenith Radio Corporation does not authorize any person to assume for it the obligations contained in this warranty and neither assumes nor authorizes any representative or other person to assume for it any other liability in connection with such Zenith television receiver or parts or tubes or transistors thereof. The warranty herein extends only to the original consumer purchaser and is not assignable or transferable and shall not apply to any receiver or parts or transistors or tubes thereof which have been repaired or replaced by anyone else other than an authorized Zenith dealer, service contractor or distributor, or which have been subject to alteration, misuse, negligence or accident, or to the parts or tubes or transistors of any receiver which have had the serial number or name altered, defaced or removed. Zenith Radio Corporation is under no obligation to extend this warranty to any receiver for which a Zenith warranty registration card has not been completed and mailed to the Corporation within fifteen (15) days after date of delivery. NOTE: UHF information in this book applies to models equipped for VHF-UHF reception. 1. Place receiver where no bright light will fall on the screen or in the eyes of the viewers.